Earlier today we posted about Rep. Devin Nunes’ less-than-stellar past week as the Chairman of the House Intelligence Committee tasked with investigating possible collusion between the Trump campaign and alleged Russian hackers that meddled in the 2016 election, and the punchline was that Rep. Nunes is starting to catch holy hell from across the political spectrum. Those flames aren’t going to die down anytime soon, as we now know from Washington Post reporting that Former Acting Attorney General Sally Yates was scheduled to testify at the hearing for today that Rep. Nunes canceled. And before the hearing was officially nixed by Rep. Nunes, Yates received multiple letters from the Justice Department and the White House Counsel’s Office informing her that certain bits of testimony containing privileged White House communications could be barred from a public hearing. 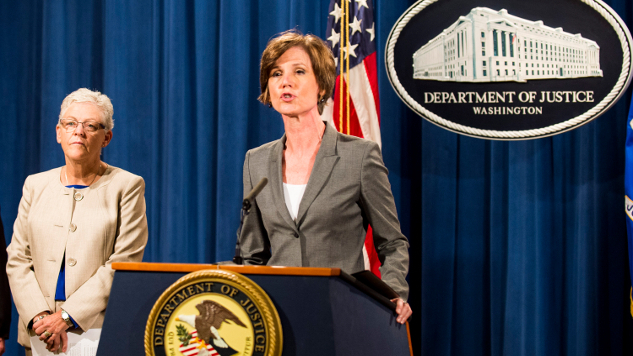 Yates was fired in January for refusing to back the Trump White House’s first travel ban, which was eventually defeated by the Ninth Circuit Court. And she’s also the one who went to White House Counsel Donald McGahn and told him that routine intelligence surveillance into Russian communications showed that former National Security Adviser Mike Flynn had discussed Obama-era sanctions with Russian Ambassador Sergey Kislyak. Flynn later lied about the nature of the conversations with Vice President Mike Pence and Flynn was let go when that contradiction was found out. Of course White House Press Secretary Sean Spicer denies the motivation for the cancellation, but did say that he “looks forward” to future testimony from Yates. Such a statement, however tepid, does no favors for Rep. Nunes and only fans the flames on what’s providing to be a heated week for the committee chairman. You can read Rep. Schiff’s full statement on the matter below.